Gigi Merove-Pierre's daughter remains in the rubble of the Caribbean Market. 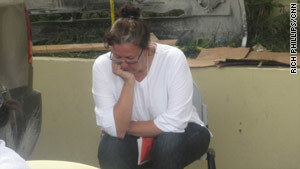 Port Au Prince, Haiti (CNN) -- Sometimes she paced and sometimes she sat and pondered. Gigi Merove-Pierre has been at the Caribbean Supermarket for a week now, but Tuesday might have been the most painful day. On this day, the engine roar from the bulldozers, cranes and power tools went silent as rescue workers ended their work here -- leaving about 100 people entombed inside, including Pierre's daughter, Paola. "Things happen in life. We have to accept it," she said. The families of the missing were given a burst of hope over the weekend, when rescue teams from New York, South Florida, and Turkey freed five people, who had been trapped for about five days, living off the market's food, including peanut butter and jelly. It gave these families more hope than they could have ever imagined. "That man who was inside, he was eating jelly. He was fine. Everybody was fine," said Pierre. "So, maybe there is other people there," she said. But, on this day, the families were left to watch the rescue teams pack their gear and leave. "You have to accept the realization that the potential for survivability is extremely low," said Capt. Joe Zahralban of the South Florida Urban Search and Rescue team. "It gets to a point where you can only risk the rescuers' life so much before you say, we don't think there is anybody left," he said. Paola's aunt, Mireille Merove-Pierre, implored the firefighters to reconsider, knowing that earlier rescue teams found nothing, while later teams returned to rescue five people. "We have listening devices where we can hear heartbeats," one rescue fireman told her. "We've gone in with all the cameras. But at this point our search is not showing us anything," he told her gently. But this family is not yet giving up. They are trying to arrange for their own equipment to be delivered so they can begin their own search for Paola in the rubble that was once a five-story market. "We don't want to give up. We are waiting for a grapple... to take this away. And go slowly into the supermarket," said Mireille Merove-Pierre. Before the rescue teams left the site, there was a mutual show of respect. A brief ceremony took place within the ruins of the once thriving market, which allowed the Miami team and the team from Turkey to recognize each other for their round-the-clock efforts over the past few days. "Each one of you guys, you gonna have a very big areas in our heart. We gonna remember you all times,"said Samer Tahmoush, the store manager. "And your names and your faces, they are going to be in our minds forever because we appreciate what you do, so much," he said. The relatives and the store manager all vowed not to give up until all the bodies are recovered. "We're not leaving here until we get a body," said Michel. She would not give us her last name. She believes that her uncle, Jean Rosier-Descardes, is still alive. Michel says that her uncle sent a text message to a Haitian radio station a day after the earthquake hit. But he hasn't been heard from since. "We have to stay strong at this point. We know he is there ... and that he's waiting for us to come for him." Across the parking lot, sitting next to the car their daughter drove to the market, the Pierre family is remembering their 30-year-old daughter, Paola, as a warm person. She is the mother of a 4-year-old son. "He doesn't understand. At that age you are like an angel. He doesn't understand," said Gigi Merove-Pierre. But one day, he will be told about what happened to his mother, when a simple trip to the market put her in the wrong place at the wrong time, and men and women from all over the world helped try to find her.